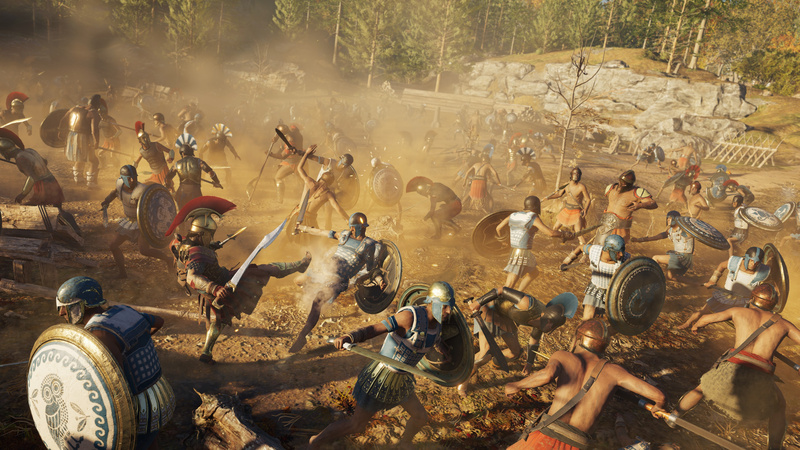 We've spent over 75 hours with Assassin's Creed Odyssey, and in all of that time, we've stumbled across a particularly nasty bug twice. Well, we call it a bug but we're not really sure what it is. All we know is that during two especially large fights in two especially large enemy camps, enemies started clipping through the ground and the game's frame rate tanked to the point where the title was totally unplayable and we had to reload our save. Strange to say the least. As it turns out, we're not alone -- and some players have apparently had it happen much more regularly. We had hoped that patch 1.0.3, which launched yesterday on PlayStation 4, would have fixed the issue, but according to multiple reports, that's sadly not the case. Some players are saying that they're still running into the problem every now and then when things get particularly busy. As far as we can tell, there's been no direct response from Ubisoft regarding the frame rate issue. We're sure that the developer knows about it, but hopefully it's fixed sooner rather than later. Have you ran into this problem? Please avoid killing the frame rate in the comments section below. Glad to see this getting attention, performance could be a bit better in general, especially on base PS4. It's getting harder and harder for these AAA games to run well on the base PS4, so, yeah, I'm fully expecting the PS5 sooner than later. Presumably it's OK on PC? @Ralizah Apparently the PC version can be very demanding from what I've seen. Some people are having quite major issues running it properly. never buy a Ubisoft game on launch day - after Unity its always better to wait until all the bugs have been ironed out. @ShogunRok Probably optimization issues, then. I've seen clips of this: it looks good, and I'm sure there is a lot going on in the background, but it's not like this is the new Crysis. Fortunately I haven't run into this yet, but then I'm only about 8 hours or so into the game. Hopefully it'll be fixed soon and I'll never see it. @Ralizah So why the games I play on my base PS4 run fine? Because I buy them once patched. Even on PS5 games will run badly if badly programmed. @andreoni79 Games aren't necessarily badly coded at launch. Patches can change settings that essentially lower the visual quality to improve performance so that they run better. These changes may not be obvious - it could be a change in how aggressive the dynamic resolution scaling works - effectively dropping in resolution quicker or maybe even to a lower scale to minimise frame rate drops. It maybe that they change the draw distance for which the highest console quality shadows, textures or objects appear in relation to the character so the load on the GPU is reduced. There are numerous ways a developer can 'optimize' a game to improve its performance without changing any of the programming code. 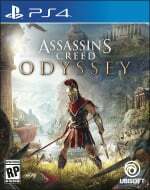 There is a BIG difference between Assassins Creed Odyssey running at 4k with all the visual settings turned up to Ultra and the base PS4 console version with generally medium to high settings, capped at 30fps and the use of dynamic resolution scaling. Its not the most compromised version but its also not as visually impressive as it was built to be but scaled down to run on the available hardware. Its not just AC of course as that applies to virtually all games made. The difference with exclusives though is that they can tweak the environment for example to the limitations of the hardware - draw distance causing an issue, reduce it by putting a wall in to limit that draw distance, too many enemies causing an issue, limit the count. With multi-platform games, they try and keep the game the same across all platforms and therefore have to reduce visuals and/or frame rates to run on 'weaker' hardware. There is a reason that Base Xbox One has the lowest resolution/visual quality because it has the weakest GPU and its the most scaled down version of the game. There maybe occasions where the programme is not perfect, especially when ported from one machine to another but most performance improvements are a result of compromises elsewhere. You can get some patches that may make improvements because of changes in the background - maybe something like an adjustment to the Asset streaming bandwidth, reducing an assets size or changes to the environmental framework to reduce clipping and glitching through supposedly solid objects but often, its more likely a slight tweak to one or more visual setting to reduce the demand on the hardware and improve the performance. With PC's, you have many visual settings and these are offered so that the player can optimise their game for the hardware they are using. Devs can't make the game fixed at 4k Ultra and a minimum of 60fps because a LOT of PC gamers wouldn't be able to run the game. They give them the options to run at lower res, options to change a lot of the visual settings with various degrees so that the gamer can tweak these to get the game running at the level they want with the hardware they have. Its also not easy to build a game like AC, the size of the world with all the separate parts and multiple people that working on different aspects, then pulling all those pieces together and getting it running on various different platforms with various different hardware specs. Thanks for reporting this, @ShogunRok. These FPS drops are incredibly annoying. While it's not enough to completely ruin my experience, and I'm having a ton of fun with AC: Odyssey, it's a literal headache to deal with. It's just historical accuracy, things were a lot slower back then. Women soldiers though, lol, what the hecks that about amirite?! I've hit level 36 and have put in a good number of hours into the game. I personally have not experienced the frame rate issue. But I have experienced the freezing multiple times like @Spectra reported above. I don't have the fan noise issue currently. I did have it before, particular with Spiderman - but I recently cleaned my fan thoroughly and the thing is now dead silent. Should mention I'm running the game on a PS4 Pro so maybe that's why I'm not experiencing the frame rate issue? I've played it around 30 hours total by now, on a regular ps4, and I haven't had any issues. No freezes, no frame rate drops and no noisy fan, though I cleaned it recently because while playing GOW it was incredibly loud. Just lucky I guess... I' m not used to it... usually, if there's a bug or a glitch in a game, no matter how rare and uncommon it is, I get it. So I should probably say that I haven't encountered any problems... yet. I had it freeze up a few times on a base xbox one. Didn't happen to me yet but I only did 3 major battles! I've encountered it once in over 30 hours. Had to restart the game to fix it. Other than that the experience has been flawless. Have to admit though, I'm kinda crappy at noticing technical issues unless they're major framerate dips or enormous amounts of lag. 3 times in 65 hours. 1 time it resolved itself after waiting and the other 2 times I had to restart. 'Feels' like a memory overflow if that sort of thing can happen on a PS4 Pro. Might just be an Animus Bleeding effect, the game does warn about that in the tips section. I'll ask my eagle. Happened to me yesterday, I noticed a corpse glitching through the ground before the frames dropped. A few seconds later the game froze completely and didn't recover. I love this game but my biggest game breaker is the extremely loud noise of the PS4pro's fan. Never played a game before that made the console that noisy - it is even louder if you are in the menu. Other games that use the power of the console 100% are not even close to be that loud. I can't even understand the dialogs anymore. Need to find my USB headphones to play this game. This has happened to me and it wasn't even in any of the big battles. Just at one of the bays in Khepellonia. Trying to run around the captain and the frame rate just went, took 2 minutes of stuttering before it levelled out and I could continue, not much on screen tbh that should cause it. Hope it gets fixed soon as I don't want that during one of the big battles. It'll probably get fixed seeing how long Ubisoft want people to actually play the game, I've noticed a few frame rate drops on the Pro nothing major as of yet though so fingers crossed..
Just had it twice this afternoon in the same mission (freeing the prisoner from cyclops). Prisoner and a guard he is fighting have their torsos (in the background of this clip) glitch into the ground and the game grinds to a halt.